It is that time of year again, when a group of us are focused on the annual SA fundraising event The Big Lunch 2014. A discounted rate has now also been offered for late comers, so please, if you haven’t already booked your ticket for 1 or table of 10, consider doing do. 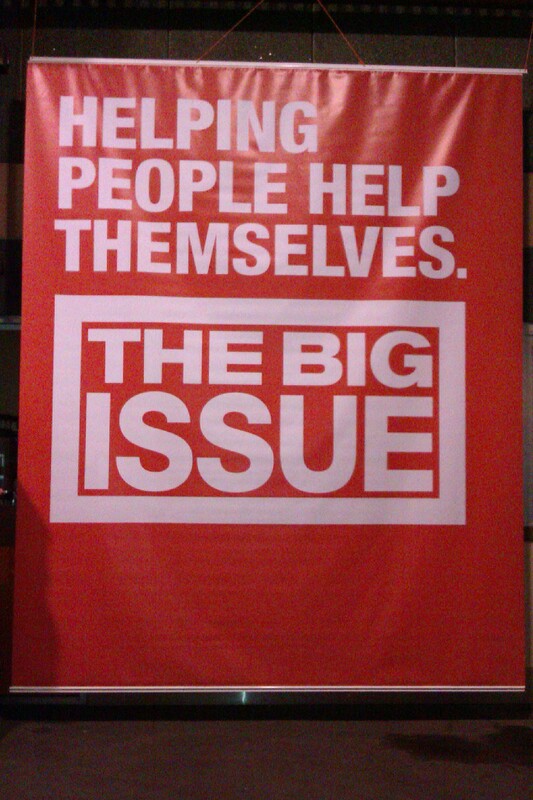 What I love about The Big Issue is one of their mottos pictured here, as well as “A hand up, not a hand out”. The idea of empowering people to improve their lives by working, earning money, and re-engaging with the community appeals to my sense of right and wrong. The philosophy of teaching a man to fish, rather than feeding him is the same, and at the end of every day, we have to help ourselves… but for those who need a hand to hold to get up it is good to be able to provide one occasionally. I cannot imagine living on the streets in Adelaide at the moment. Last week we had huge amounts of rain, storms, hail and very cold temperatures. It is easy to forget about the homeless, wrapped up in my snug ned at night, ot sitting in front of the heater… but having made friends with a few of The Big Issue homeless vendors keeps it front and centre. Contributing as a volunteer helps keep my own life in perspective, and I get more from volunteering than I will ever be able to give back. If you can’t attend, but would like to give a donation towards the Big Lunch, or are in a position to purchase an annual prescription of the Magazine, please do so here. Watch this https://vimeo.com/100358103 taken at the lunch last year.